Dr Yi Wu is lecturer in Real Estate. 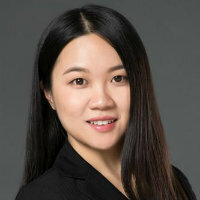 Dr Wu spent time as a visiting scholar at the University of San Diego and the National University of Singapore and worked for Yuexiu, a Hong Kong based real estate investment trust. She was honoured as the Lincoln Young Scholar in 2017 and a Distinguished PhD in AREUEA in 2016. She is teaching financial analysis in real estate and software applications. Her research focus is on housing economics, corporate finance and property technology. Her publications appear in Real Estate Economics, Applied Economics and Journal of Risk and Financial Management. She serves as the reviewer for Journal of Real Estate Research, Journal of Sustainable Real Estate and International Journal of Strategic Property Management. She received a research grant from European Public Real Estate Association (EPRA) in 2017. She is a regular presenter at major international real estate conferences, AREUEA conference, ARES annual conference and ERES annual conference. Currently, Dr Wu is working on property technology (Proptech) Ecosystem with interdisciplinary approaches. She examines the role and potential of Artificial Intelligence (AI) in commercial property investment both private and public. It compares the performance (risk and return) of portfolios built on conventional techniques with those obtained form AI powered algorithms. Particular attention is given to the use of AI in identifying risks which has wider implications in the real estate industry. She works closely with business organisations in order to support their engagement with the research base thereby enhancing their innovation potential. Chinese (Cantonese) (can read, write, speak, understand spoken and peer review), Chinese (Mandarin) (can read, write, speak, understand spoken and peer review) and English (can read, write, speak, understand spoken and peer review). I am currently working on property technology (Proptech) Ecosystem with interdisciplinary approaches. The technological change of the real estate industry, and its consumers to our attitudes, movements and transactions involving both buildings and cities. I found that new trends are emerging across all sectors of the real estate industry: co-working is disrupting the office space sector, co-living is offering new alternatives in residential real estate, crowdfunding is reshaping new construction and real estate investing, and home swapping is growing increasingly popular for seasonal rentals. PropTech is an economic industry composed of companies which use technology to make real estate transactions more efficient and alignment to the market. Currently, I set up the direct and indirect property portfolio based on machine learning models powered by natural language processing (NLP) and a high performance data infrastructure - to match and unify data sets, compiling the different sources of data in the industry. It aims to compare the portfolio performance with the historical industry benchmarks. Furthermore, the study compares the timing of decision making about detecting and exploiting market anomalies. In this paper, we study the household formation patterns of first‐, second‐and third-generation African-American, Asian, and Hispanic/Latino Millennial immigrants, including social interaction effects. We further specify findings by considering reasons for moving including African-American Great Migration and Mexican border, financial crisis, return migration, immigrant network and government mortgage aid, which provide rich policy implications for household formation patterns ownership of millennial immigrants. We examine convergence of Office property markets in 36 Local Authorities with complete rental growth data over the sample period from 1980 to 2017.Furthermore we use a number of property, employment, population, geographical and economic data to try to identify the differences between the convergence clubs. We investigate potential forecast gains arising from the adoption of Deep Learning models over conventional time-series models. We make use of the monthly commercial property data-series at the city level in the Europe produced by RCA. We are interested both in directional and point forecasts. The forecasting by deep learning models is accurate up to 6 months. Wu, Y. and Lux, N. (2018). U.K. House Prices: Bubbles or Market Efficiency? Evidence from Regional Analysis. Journal of Risk and Financial Management, 11(3), pp. 54–54. doi:10.3390/jrfm11030054 . Wu, Y. and Li, Y. (2018). Impact of government intervention in the housing market: evidence from the housing purchase restriction policy in China. Applied Economics, 50(6), pp. 691–705. doi:10.1080/00036846.2017.1340569 . Wu, Y., Sah, V. and Tidwell, A. (2016). Housing Preferences of Asian and Hispanic/Latino Immigrants in the United States: A Melting Pot or Salad Bowl. Real Estate Economics. doi:10.1111/1540-6229.12178 . Wu, Y. and Tidwell, A. (2015). Inflation-hedging properties of regional Chinese real estate market: evidence from 35 cities in China. Applied Economics, 47(60), pp. 6580–6598. doi:10.1080/00036846.2015.1080811 . Tsolacos, S., Wu, Y. and Duah, S. (2018). The joint dynamics of European office yields. Journal of Real Estate Research, Journal of Sustainable Real Estate, International Journal of Strategic Property Management, Sustainability, Economies, Referee, Jan 2017 – present. 25th European Real Estate Society (ERES) Meeting. (Conference) Reading.UK (2018). Invited speaker. 25th European Real Estate Society (ERES) Meeting. (Conference) Reading, UK (2018). Invited speaker. 2018 American Real Estate Society annual meeting. (Conference) Bonita Springs,Florida, US (2018). Invited speaker. European Public Real Estate Annual Conference. (Conference) London,UK (2017). Invited speaker. Urban Economics and Public Finance Conference. (Conference) Cambridge, Massachusetts,US (2017). Invited speaker. 2017 American Real Estate Society Annual Meeting. (Conference) Coronado, California,US (2017). Invited speaker. 2017 American Real Estate Society (ARES) Annual Meeting. (Conference) Coronado, California,US (2017). Invited speaker. 2016 The American Real Estate and Urban Economics Association Joint Allied Social Science Associations. (Conference) San Francisco, California,United States (2016). Invited speaker. 2015 American Real Estate Society Annual Meeting. (Conference) Fort Myers, FL,US (2015). Invited speaker.